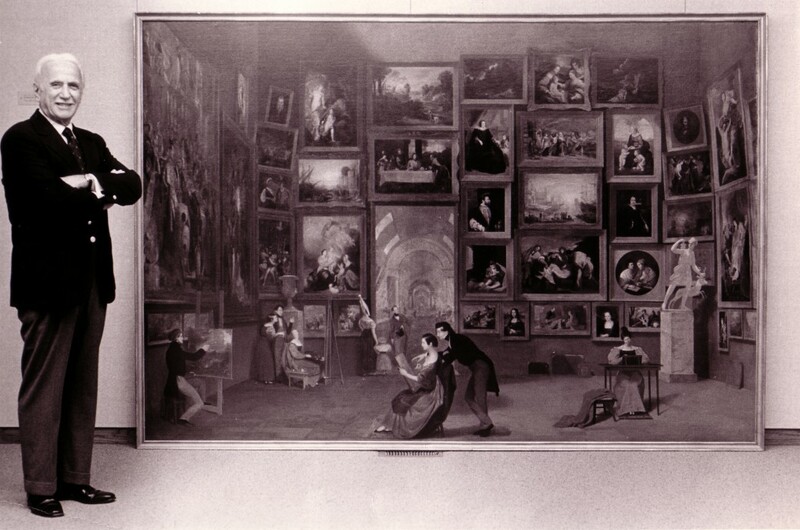 Daniel Terra added Samuel F. B. Morse’s iconic painting Gallery of the Louvre (1831–33) to his collection in 1982. Chicago, IL—The Terra Foundation for American Art announced today that Samuel F. B. Morse’s monumental painting Gallery of the Louvre will embark on a multi-year tour across the United States in January. Kicking off at The Huntington Library, Art Collections, and Botanical Gardens, in San Marino, CA (January 24–April 20, 2015), the tour will visit nine museums across the country, including venues in Fort Worth, TX; Bentonville, AR; Detroit, MI; Salem, MA; and Winston-Salem, NC. The exhibition, Samuel F. B. Morse’s “Gallery of the Louvre” and the Art of Invention, is the culmination of the painting’s extensive conservation treatment in 2010 and two years of scholarly investigation. It will be accompanied by an anthology of the same title, published by the Terra Foundation and distributed by Yale University Press. Known today primarily for his role in the development of the electromagnetic telegraph and his namesake code, Samuel Morse began his career as a painter. Created between 1831 and 1833 in Paris and New York, Gallery of the Louvre was Morse’s masterwork and the culmination of his studies in Europe. In addition to highlighting renowned works by the Old Masters, Gallery of the Louvre serves as a painted treatise on artistic practice, positioning Morse, depicted as the centrally placed instructor in the work, as a link between European art of the past and America’s cultural future. In 2010 Gallery of the Louvre underwent a six-month conservation treatment in the studio of Lance Mayer and Gay Myers, specialists in American painting who have restored such major works as Emanuel Leutze’s Washington Crossing the Delaware (1851; Metropolitan Museum of Art) and Rembrandt Peale’s The Court of Death (1824; Detroit Institute of Arts). The conservation repaired damages that had occurred over time and yielded insight into Morse’s working methods. “The conservation treatment greatly improved the overall look of the Gallery of the Louvre and confirmed that Morse was as fearless an experimenter with painting media as he was with the daguerreotype and the electromagnetic telegraph later in his career,” added Brownlee. The painting’s conservation was documented in the 30-minute video A New Look: Samuel F. B. Morse’s “Gallery of the Louvre,” produced by Sandpail Productions for the Terra Foundation. The video provides information about Morse’s career, as well as paintings depicted in the picture, and features interviews with conservators, curators at the Terra Foundation and the Musée du Louvre, and other specialists, including Morse scholar Paul J. Staiti, Alumnae Foundation Professor of Fine Arts at Mount Holyoke College. From 2011 to 2013, the painting was exhibited for extended periods at the Yale University Art Gallery, the National Gallery of Art, and the Pennsylvania Academy of the Fine Arts, where it was the subject of scholarly investigation and dialogue. Catherine Roach, assistant professor of art history at Virginia Commonwealth University. This anthology brings together fresh insights by academics, curators, and conservators, who focus on the painting’s visual components and the social and historical contexts that make it such a rich, complex work. Established in 1978, the Terra Foundation for American Art is dedicated to fostering the exploration, understanding, and enjoyment of the visual arts of the United States. With financial resources of more than $350 million, an exceptional collection of American art from the colonial era to 1945, and an expansive grant program, it is one of the leading foundations focused on American art, supporting exhibitions, academic programs, and research worldwide.